If you're one of the longer-tenured loyal readers of this blog, you may have noticed that we don't exactly feature a lot of produce reviews. It's not because we're anti-vegetable or anything (well, at least not since college), but for me at least, there's a couple pretty basic reasons. First, as much as I hate to say it, the one section at Trader Joe's that has disappointed me on the most consistent basis is the "fresh" fruits and vegetables. I have picked up more than my share of half-rotten clementines and veggies that turn to mush if you don't eat them the same day at TJ's. I'm not alone in this - one recent article listing what NOT to get at TJ's ranked produce the number one thing to avoid at TJ's (even ahead of the sushi) and I agree with every reason, though not every product, listed there. Another thing is, I've had enough satisfactory experiences with a bag of apples or an ear or two of corn from there, but they're kinda tough to review. I mean, I can write a break-up letter to a box of peanut brittle or imagine a heavyweight battle between competing soy sausage brands, but how do you review something like a green pepper in any depth? It's so much easier to write about a bottle of carrot juice than a bag of baby carrots. Interestingly to me at least, potatoes aren't considered either fruits or vegetables, but instead some sort of plant classification called a "tuber." That kinda sounds like a vague seventh grade insult, to call something a tuber. It all has to do with some hoity-toity botanical hairsplitting which really, I don't get. All I know is, potatoes count as produce, and in general they sure are tasty, and that's good enough for me to consider this our first produce review on this blog. If you like potatoes, you'll like these. If you don't, well, you probably wouldn't buy them anyways. TJ's Teeny Tiny Potatoes are just that - a one pound mesh bag of dozens of little potato runts. Nothing wrong with them, they're just small. I tried to see if these are a mini potato breed or just dug up at a real young age, but couldn't seem to find any definitive answers, and with over 5,000 types of potatoes in the world, I didn't want to sort through each type. It seems a little less tragic to think of them as just a small potato as opposed to being harvested and eaten before it had a chance to live and thrive as a full-blown Russet, so I'm going with that, a sub-race of rooted goodness if you will. One of our favorite ways to cook them up is in a foil pack with some butter, herbs and spices right on the grill. There's two major advantages that the Teeny Tiny Potatoes have here over their much larger cousins. First, you don't have to chop them all up - just pocket them in and let them sizzle for a while. Each is small enough to be able to soak in the butter that with enough fire time, each get cooked through easily. And for me, one of the parts of the potatoes that I like the best is the outer skin, and with these, each bite is surrounded by tasty potato epidermis. Mmmm. Granted, with all the skin intact, these potato munchkins tend to inwardly insulate pretty darn well, so as a word of caution that I grant from much experience, give these a few minutes to cool down before you sink your chompers into them. Your tongue will thank you. I've also used these for simple tasty homefries by quickly chopping them in half. Short of doing anything too ridiculous like trying to slice them into mini fries or wrapping each in foil for uber small baked potatoes to top with itsy bitsy bacon slices, I'd imagine that pretty much any way you like a potato, these would work well as substitute for a regular sized spud. It's tough to exactly tell, but they seem to be more of a golden variety, which is more than alright by us. Both Sandy and I enjoy them quite a bit. In fact, with me recently working on (and nearly completing) a small raised vegetable bed for our front yard, we're hopeful that a few of the remaining ones will spawn the next generation of dwarflings if we toss them in the dirt and let nature go at it. And I can say with absolute certainty that this is the one TJ's produce product that has never let me down, whether in overall quality or shelf life. Other than that, we just like us some potatoes. "Mmm carbs! I love carbs!" as Sandy eloquently exclaimed when I asked for her opinion. She gave them a five, and I figure that includes some extra credit for these being so cute and adorable. 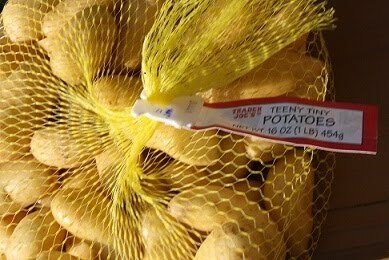 For me, I like them just fine, and don't have too many of the same qualms as I have with other miniature foods, but in the end I don't know how much credit I can give Trader Joe's for not screwing up a small sack of spuds ... eh, 3.5? Sure, why not? I am fairly sure that these little gems are from the family of waxy yellow gold yukons. And I think they are harvested at this little size just because TJ asked that they be this size only. Of course they could be some unknown German or other eastern European miniature potato variety, but I doubt it. You just may be right. Planning to plant some this weekend so if they grow, maybe we'll know a little bit more! Roast them in the oven with olive oil, salt, and a few herbs... Delish! Ange, sounds great! We've done something similar on the grill. I used these in my vegetarian faux beef stew and they were perfect. I love this blog too,I am always at trader joes. I want to make rosemary potatoes with these too. Who knew you could write so much about potatoes. We too don't buy much from Trader Joe's produce department but might have to try these out, sound yummy. I'll take that as a compliment :). Potatoes (white and sweet) are generally classified as starchy vegetables, if you ever need to know. In dietary advice, you often see the distinction made. Starchy veg can be used in the same place as grains in meals (for example, you can use potatoes as the base for non-starchy veg and sauces instead of rice or corn or wheat). I like to put baked beans on a spread out baked potato sometimes instead of over bread or rice, for instance. The starchy veg are good eats, too, but calorie counters can pack in more food if they limit starchies and pile on the non-starchy veg with wild abandon.